Two years ago I made a Box of Chocolates cookie, but the "chocolates" were each a small, separate cookie on top of a big heart cookie. 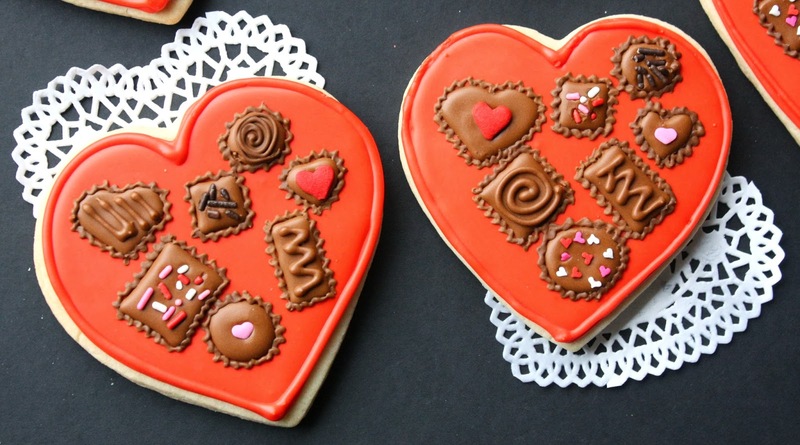 This version is all one cookie, and the "chocolates" are made from royal icing, decorated directly onto the heart cookie. The cookies are 4.25-inches from side-to-side at the widest part, and 4.25-inches at the tallest part from top to bottom. This design was directly inspired by cookies made by Jen of My Kitchen Addiction, three years ago. Thanks, Jen! These cookies were so much fun to make! I used plastic tweezers (for food only) to place the sprinkles on the "chocolates", and I enjoyed the process. I only made a dozen cookies though; it might have been a different story if I had made many dozens! 1. 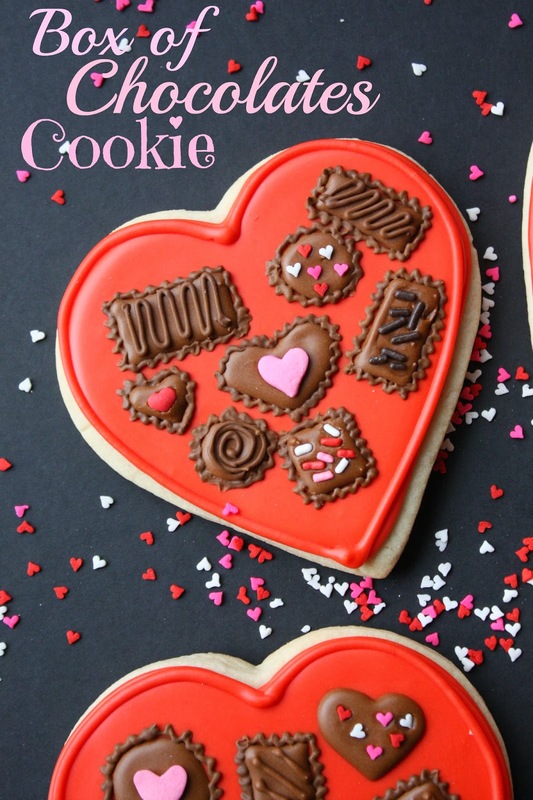 Roll out sugar cookie dough, Cut out hearts with cutter and place on baking sheets. 2. Bake according to recipe and allow cookies to cool. 4. Divide the royal icing, adding the (tulip) red to some, and the brown to some. 5. Thin the royal icing so that when a thick "ribbon" of it is pulled up with a spoon or knife, it falls back into the bowl and disappears into the royal icing on a count of 5. 7. With the #2 tip use the brown icing and make the chocolates (don't add icing decorations on top, or borders yet). 8. Add the sprinkles while the brown is still wet (I used the tweezers to apply them). 9. Allow the "chocolates" to dry for an hour or two before adding the brown icing decorations on the tops. 10. With the brown icing and the PME 1.5 tip, add a zigzag type border to resemble a brown candy liner. 11. Lastly, outline the heart again with a #3 tip and red icing to add more dimension to the "box". P.S. I want to give a shout-out to my daughter-in-law for coming to my rescue and adding a "pin it" button (activated whenever you "hover" over a photo) to my blog! Thanks, Lois! SUE, I love these cookies! The sprinkles and the chocolate swirls on top....adorable!! Pinning now! These are the cutest cookies ever! Adorable! I really want to get into cookie decorating every time I visit your blog! All your ideas and cookies are just amazing. These are really beautiful. So so cute!!!!! 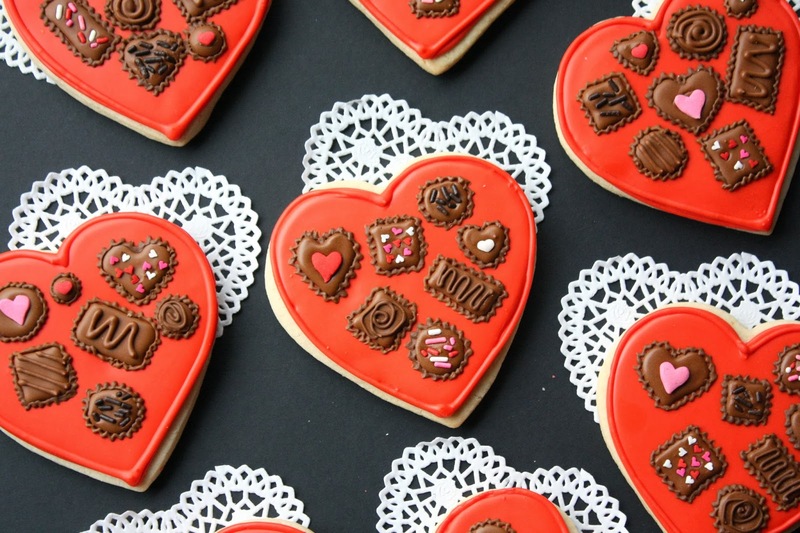 Beautiful cookies and such a fun idea! Love it! I put those hover buttons on my blog. I'm not sure people can find them but I like them. I love these cookies. I'd much rather eat a good sugar cookie than a chocolate any day but when I go for chocolates I like the dark ones. You get some brownie points for installing the "pin it" button, Bonnie:) Thanks for your comment! Love these cookies, Sue... too adorable! These cookies are adorably cute! What a cute idea! This is awesome! I would love if someone gave me something like this! These cookies are so lovely, Sue. 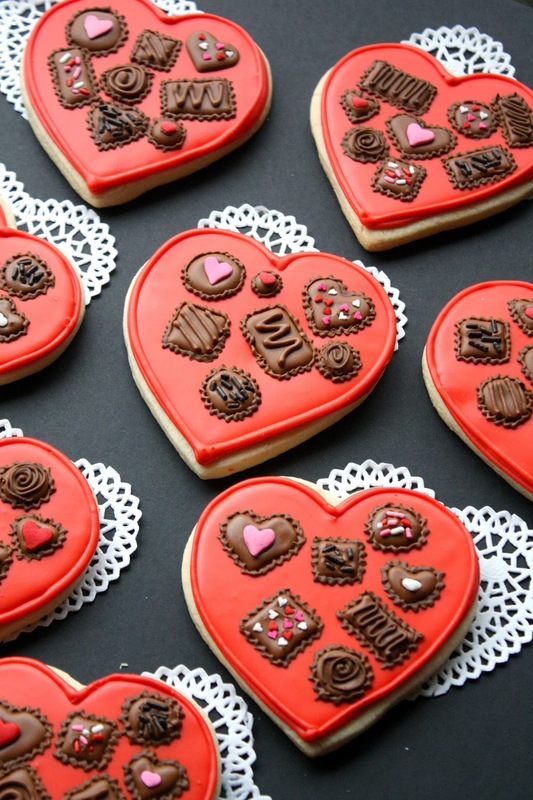 I have always wanted to make a box of heart cookies, and now seeing your fabulous cookies - I REALLY want to make some! I can just imagine how awesome they would be, Kim! Yes, dying over these adorable cookies!!! Amazing! Erin, You are so creative; just keep at it! I am sure they will be loved and yummy! I am trying hard to invent a creative present for my husband. St. Valentine`s Day is in a few days! These hearts look adorable and I guess that they are very tasty because they are very appetizing. I guess it is a nice present for your beloved. You are talented beyond measure! You sure know how to make a gal feel great, especially coming from the Cookie QUEEN herself! :) Thanks, Callye! I LOVE visiting your blog!!! Your creativity amazes me every time!!!! These are adorable!!! Thanks for your sweet comment, Amalia! Wow, this is so creative! Great job! I'll try the cookies and I hope the result will be as good as yours! Absolutely adorable and brilliant! I just want to eat all these .